I hate to call this a recipe, but it is darned delicious, (and the mushrooms are a perfect base for a real recipe I’ll share with you later this week, mmm). 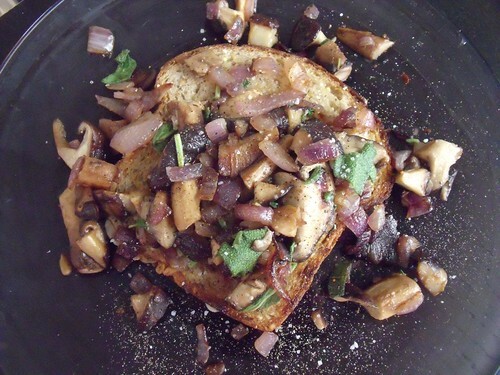 I was craving mushrooms on toast for about the last six months, thanks to Nigel Slater. So they were breakfast! Serves 4, or leaves you with enough mushrooms to use in the upcoming sneaky recipe. In a large pan, sweat the onion until translucent. Add the mushrooms, sage, and thyme, and sauté, until cooked through (about 4 mintues). Season with salt and pepper, and serve over toasted bread. Yummm. Looks so yummy. My mouth is watering. Love the fresh sage and thyme too.